2 Instituto Nacional de Limnología, UNLCONICET. Ciudad Universitaria, Paraje El Pozo, (3000) Santa Fe, Argentina. 3 Departamento de Ciencias Naturales. Facultad de Humanidades y Ciencias, UNL. Ciudad Universitaria, Paraje El Pozo, (3000) Santa Fe, Argentina. 4 Facultad de Ciencias Naturales y Museo, UNLP. Av. 60 y 122, (1900) La Plata, Argentina. 5 Laboratorio de Fotobiología, INIBIOMA (UNCOMACONICET). Quintral 1250, (8400) San Carlos de Bariloche, Argentina. Chytridiomycosis, a disease caused by the chytrid fungus Batrachochytrium dendrobatidis (B.d. ), is recognized as one of the major factors of amphibian decline. Global trade of amphibians has been identified as one of the causes of B.d. spread, involving hundreds of species world wide. In this work we detected the presence of B.d. through histological examination on 5 out of 9 analyzed specimens of bullfrogs (Lithobates catesbeianus) from a farm in Santa Fe City (Argentina), deposited since 1993 in the herpetological collection of the Provincial Museum of Natural Sciences "Florentino Ameghino". Our finding represents the oldest record of B.d. for Argentina and the first case of the chytrid fungus infecting the exotic bullfrog in this country. We emphasize the importance of determining and monitoring the distribution and spread of B.d in Argentina, particularly in areas where feral bullfrog populations have already been identified. Key words: chytridiomycosis, biological invasion, Museum historical records, Argentina. La quitridiomicosis, enfermedad emergente producida por el hongo Batrachochytrium dendrobatidis (B.d. ), es reconocida como uno de los factores causantes de la declinación de anfibios. El comercio mundial de anfibios ha sido señalado como una de las fuentes de dispersión de B.d. En este trabajo se detectó la presencia de B.d. en la especie exótica rana toro (Lithobates catesbeianus) mediante cortes histológicos en 5 de 9 ejemplares provenientes de un criadero de la ciudad de Santa Fe (Argentina), depositados y conservados desde 1993 en la Colección Herpetológica del Museo Provincial de Ciencias Naturales "Florentino Ameghino". Este registro representa el hallazgo más antiguo de B.d. en Argentina y el primer caso de este hongo en la rana toro exótica en el país; por lo que enfatizamos la importancia de determinar y monitorear la distribución y dispersión de B.d., particularmente en los sitios donde ya se han detectado poblaciones silvestres de rana toro. Palabras clave: quitridiomicosis, invasiones biológicas, registros históricos de museos, Argentina. There is increasing evidence that the amphibians trade is responsible for the spread of the global amphibian disease named chytridiomycosis, caused by the chytrid fungus Batrachochytrium dendrobatidis (B.d.) (Daszak et al., 2004; Fisher and Garner, 2007). Several works report the presence of B.d. in the pet trade, in Zoo animals, in introduced species, and in the laboratory animal trade, among others (e.g. Mazzoni et al., 2003; Hanselmann et al., 2004; Garner et al., 2006; Picco and Collins, 2008). The North American bullfrog Lithobates catesbeianus, is native to southeastern Canada, the eastern United States, and probably northeast Mexico, but it has been accidentally and intentionally introduced in at least 41 countries (Laufer et al., 2008). Introduced populations have been reported in several South America countries, where some B.d. infections were also recorded (Mazzoni et al., 2003; Hanselmann et al., 2004). In the 1980s, a significant introduction of L. catesbeianus began with government promotion for aquaculture in Argentina. Nevertheless, by the mid 1990s few of the original farms remained active (Luchini, 1995) and no control programs were implemented for preventing frog escapes or releases from closed farms. Since 2005, several feral populations have been detected in natural and artificial wetlands of Argentina (Sanabria et al., 2010 and citations therein). It is known that bullfrogs infected by B.d. are asymptomatic, and they spread the disease into new geographic regions (Mazzoni et al., 2003; Daszak et al., 2004; Hanselmann et al., 2004). With this knowledge, and considering the past and present L. catesbeianus farms in Argentina, we decided to study bullfrog specimens in Museum collections to track the historical presence of B.d. in the country. we report the oldest record of chytridiomycosis in Argentina. We analyzed B.d. presence in 9 adult specimens of L. catesbeianus deposited in the herpetological collection of the Provincial Museum of Natural Sciences "Florentino Ameghino" (Santa Fe City, Argentina). The specimens came from a farm located in a suburban area in the north of Santa Fe (31° 30' S, 60° 40' W), and were donated to the Museum in 1993 (MFAZV 376, MFAZV 724 to 731; MFAZV: Museo Florentino Ameghino  Zoología de Vertebrados). Skin patches of abdominal and ventral hind limbs were examined to detect fungal zoosporangia developing. Tissues were routinely processed for hystology: 2 patches per individual (5 x 10 mm) were embedded in paraffin, and sectioned at 5 µm thickness with a rotation microtome (Reitcher), resulting in 90 samples crystals (5 slides per patch) that were stained with hematoxylin and eosin. 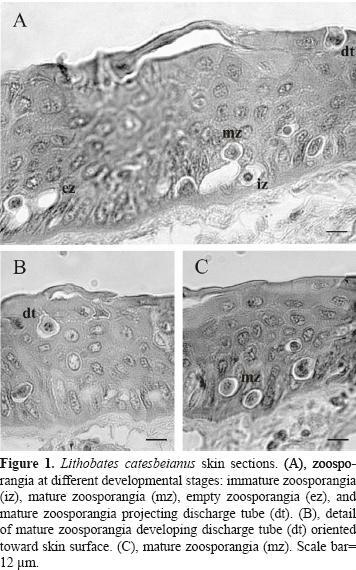 The corneous epithelium of the tissue samples was examined for zoosporagia employing a stereo microscope (Leica DM 2500) following Berger et al. (1999). Histological examination revealed the presence of B.d. in 5 out of 9 analyzed specimens. Infected specimens presented zoosporangia at different developmental stages at the stratum corneum. In addition, we observed some empty zoosporangia and zoosporangia with a discharge papilla oriented toward the skin surface (Figs. 1A, B and C). Although it is unknown which amphibian species, if any, are immune to chytridiomycosis, experimental data show that bullfrogs are among the species capable of being infected by B.d. without progression to clinical disease symptoms or death (Daszak et al., 2004). Bullfrogs are part of an increasingly centralized and expanded trade of live animals for food within South America and between South America and the United States (Mazzoni et al., 2003; Hanselmann et al., 2004). In Argentina, even though chytridiomycosis represents one of the most dangerous emerging diseases for this group of organisms, veterinary control of introduced amphibians to detect B.d. or ranavirus (another amphibian infectious disease, see Schloegel et al., 2009) are not on the agenda of governmental agencies. On the one hand, the first account of chytridiomycosis in Argentina was detected by Herrera et al. (2005) in a dead native amphibian, Leptodactylus latrans, collected in 2002. Since then, specimens belonging to 6 different native species were found infected in the country (Arellano et al., 2009; Ghirardi et al., 2009 and citations therein). On the other hand, feral populations of L. catesbeianus have been found in or near 5 of the localities where the chytrid fungus was found infecting native species (Sanabria et al., 2010 and citations therein). As bullfrogs are effective invaders and vectors of several diseases, testing the infection's prevalence in bullfrogs, and monitoring their trade and release, will further contribute to understanding the role of the commercial trade in moving of pathogens in our ecosystems (Brooks et al., 2006; Picco and Collins, 2008). The spread of this disease may affect the persistence of native vertebrates in natural habitats (SigalaRodriguez and Greene, 2009). We cannot conclude that the bullfrog introduction is the origin of B.d. presence in Argentina, because not every location with positive records of chytridiomycosis experienced bullfrog invasions and because more exhaustive monitoring is necessary to evaluate whether there is a correlation between bullfrog and B.d. presence in Argentina. But the introduced and farmed amphibians can be released accidentally or escape with the consequent risk for native fauna (Laufer et al., 2008). So, we emphasize the importance of monitoring the distribution and spread of B.d. in Argentina, focusing on conservation efforts to native anuran species and, particularly, on those areas where feral bullfrog populations have been identified. Strict regulations for the transportation and farm breeding of bullfrogs should be implemented to prevent the potential spreading of B.d. by L. catesbeianus. We thank the Provincial Museum of Natural Sciences "Florentino Ameghino", Santa Fe, Argentina, for allowing us to examine their Herpetological Collection. This study was funded by a grant to M. G. Perotti from CONICET, Argentina (Consejo Nacional de Investigaciones Científicas y Técnicas) (PIP 0100513).